Ronalyn Bio (22) came to Vietnam with Projects Abroad to gain more knowledge in the field that she wants to establish a career in: clinical psychology. She was placed at Hope Center – a center of education and intervention for children with disabilities where she worked in the department for autistic children. Ronalyn’s day-to-day work during her one month stay went as follows: in the morning she worked one-on-one with a child using skills games such as building blocks and puzzles before lunch and nap time, when she helped with feeding the children and getting them to go to sleep. She started working in the afternoons at 14:00 with similar activities; sometimes the schedule was changed up with different practices like playing with the balls or tumbling. Additionally, Ronalyn was assigned to work with one specific child to follow up with his progress and at the end of her volunteering time she gave a talk on that child’s progress. 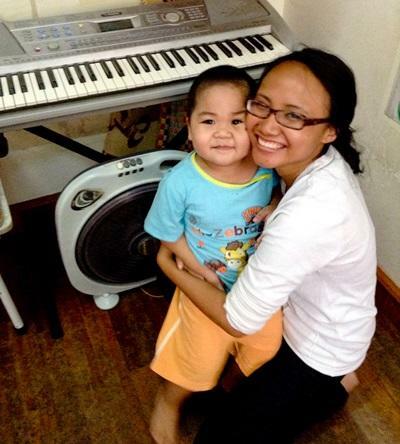 By being a volunteer in Vietnam, Ronalyn was able to perceive that the Vietnamese people did not really know how to deal with situations such as autism. “Different opinions and different experiences from people around the world, like the international volunteers, can be of a great help,” said Ronalyn. She was modest when talking about the difference she made at the center: “I think I just made it easier for the carers and the teachers there and I helped them by giving them my interest in how to play with the children. I also suggested they should clean the toys because they are very dirty and the teachers clean the toys every Friday now which is really good.” Yet Ronalyn did more than just playing with and feeding the kids, she was able to use her knowledge to improve the situation of a specific child: “The child I worked with, Lam, usually isolated himself in the classroom and over the course I worked there he ran up to me every time I walked into the classroom and hugged me. So the teachers there told me, ‘Lam really likes you!’” It was the most memorable experience Ronalyn had gained during her month in Vietnam. Volunteering at the centre gave Ronalyn the chance to gain first-hand experience in her field of study. “I’ve just graduated from psychology and I worked as a research assistant for child development since February. I think from this experience I got more hands-on experience instead of sitting behind the book and learning about it.